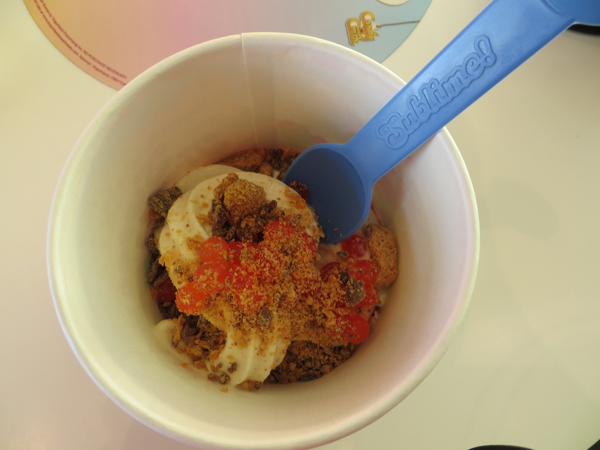 Today, after 33 days, 13 hours, 39 minutes and 14…15 seconds (give or take a few minutes), I had my first bite of sugar in the form of frozen yogurt. Ben, one of my partners in no-sugar crime the last few weeks, said he was ready to break his fast and we felt like we should do it together since, after all, we had gone through it together. We had also agreed that we should give each other a non-food reward at the end of this challenge. 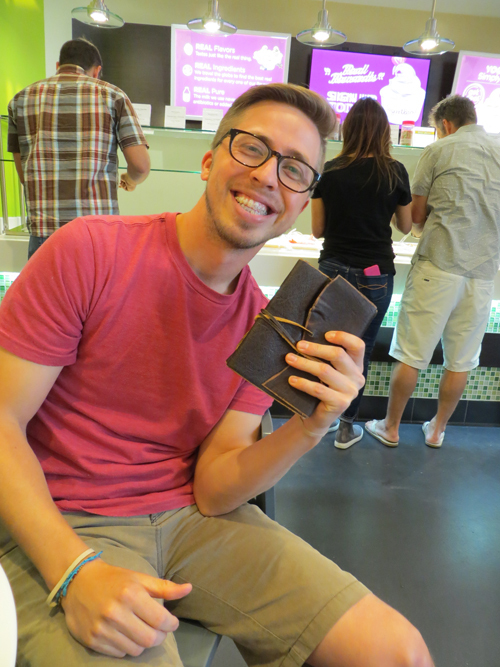 Ben wanted an “Indiana-Jones-ish” journal. #nailedit. My choice hasn’t come yet, but I thought it was most fitting for the challenge. Meager, right? 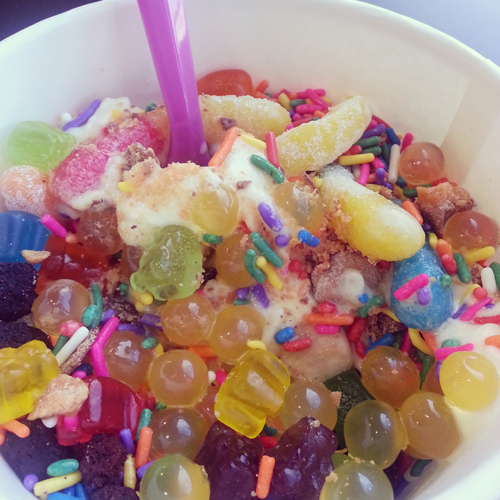 Would you think I’m crazy if I told you that none of the toppings looked that good to me? I could barely pick the two I did (mango juice balls and crushed butterfinger bars). Who am I?! 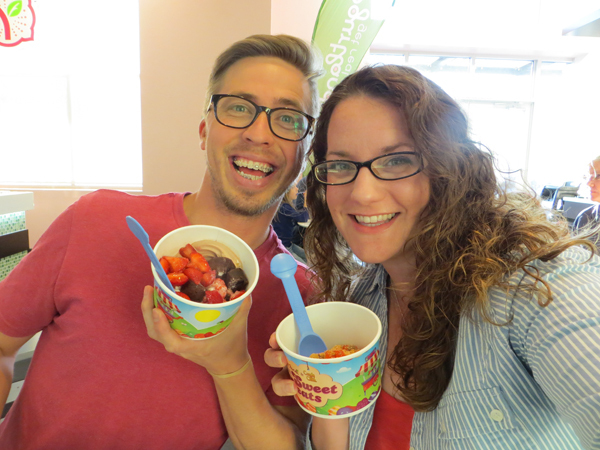 Here’s what my typical fro-yo cup looked like earlier this summer…plucked straight from instagram. Shame! That’s probably a good 9-10 ounces. Today, mine barely broke 3. And it was enough. I was satisfied. It was so very sweet tasting, too. Like I had lost the taste or something. This was the idea, right? My plan all along? To break myself of a powerful addiction. To tell myself that sugar was not the end-all-be-all to my problems? Today was a very stressful day at work. With two positions in my department still vacant and the other web person on vacation for two weeks, I felt swamped and overwhelmed and right around noon I got a killer stress headache. I sat at my desk, rubbing my head thinking of all the sugary things I would normally use to self-medicate, and realized that this was the first headache I’ve had all month since that very first week I went off sugar. I find myself prone to headaches and hadn’t realized they were completely MIA during this experiment until one creeped up today. There have been big and little revelations like that throughout the last 33 days. Moments that have caught my breath; moments that have made me reflect long and hard about my lifestyle and the choices I have made and the ones I could make moving forward. I would say that my identity with my friends and my family is firmly cemented in a “foodie/baker” category. I bake for my friends; I cook for my family. The kitchen is where I love to be and I identify MYSELF that way. That plate of cookies is my I-love-you. Those enchiladas are my screams of you’re-so-important-to-me. They were also my “love me”s. (Hello, are you a therapist?) Food has been my love language for years. Take that away and I feel mute. How can I redefine myself? Do I need to? Throughout the last five weeks, I have ruminated on this point the most. Who am I if I’m not the one carrying the plate of baked goods into the party? The answer is…I don’t know, but I’m working on it. I have never felt better. My mood swings are gone. My mid-afternoon lull (nap time) hasn’t been a thing. My blood sugar never crashes leaving me hungry or aching for a sugar pick-me-up. I hardly snack because I don’t feel hungry. It’s foreign and it’s wonderful. I feel like my brain is clear and I can work harder/longer with more focus. This is the miracle drug we’ve all been looking for. Cut the processed sugar and feel the difference! The veil has lifted and I don’t want to go back. As Morgan Spurlock taught us: You can do anything for 30 days. Researchers agree that doing something for 30 days will make or break a habit. When people ask me about being a vegetarian and are interested in trying it, I always encourage them to test it for two weeks. (That’s as long as I needed to be convinced it was the right choice for me.) I remind them that it’s not for everyone, but you’ll know in two weeks. It’s very much the same with this. 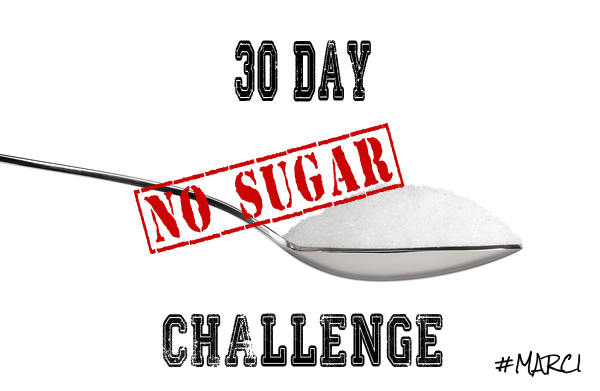 I encourage and support anyone reading this to try being sugar-free for two weeks. It’s not forever, but it’s enough to make a difference and feel the change. Four weeks, though twice as long, wasn’t a death sentence and I’ve actually enjoyed it. 30 days might just change your life. This is about as vulnerable as I can get on this blog, but I think it’s important to write about this challenge and shine the light on our society’s addiction to sugar and processed foods. I have a strong family history of diabetes and pounds to spare, so I know I’m at risk. It’s not too late to turn any train around. If you want to make a change, reach out; I’m with you 100%. Thank YOU for all of your support and encouragement, especially my Aunt Pam and Ben who valiantly fought the good fight by my side and are still talking to me. And to Joe, for always being my #1 fan and loving me fully whether I am eating brownies or plain oatmeal. Life with him is sweet enough.